WhatsApp is currently the world's most popular messaging app which allows you to stay in touch with your friends, family, and colleagues. You can send text messages, photos, videos and even make voice and video call to your contacts for free. Earlier, it's not possible to send document files over WhatsApp other than some PDFs and text files. The only way to send your documents is to use cloud storage services like Dropbox and Google Drive. Now there is a great news for all WhatsApp users. 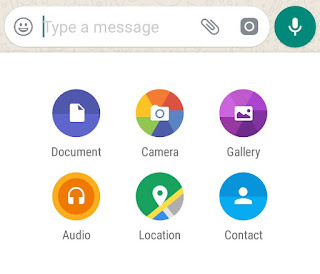 In the latest update, WhatsApp has added a new feature which lets you send any type of file or document for free. The maximum allowed file size is 100 MB and it's more than enough. This guide shows you how to use this new feature. Launch WhatsApp and open the chat whom you want to send the document. Now tap the paperclip icon at the bottom of the screen to add an attachment to your message. Here you will see a number of options available for attachment like document, photo, video, audio, location, and contact. Choose the first option - Document. Now select the file you wish to send. Finally, tap the "Send" button in the pop-up window. That's it. 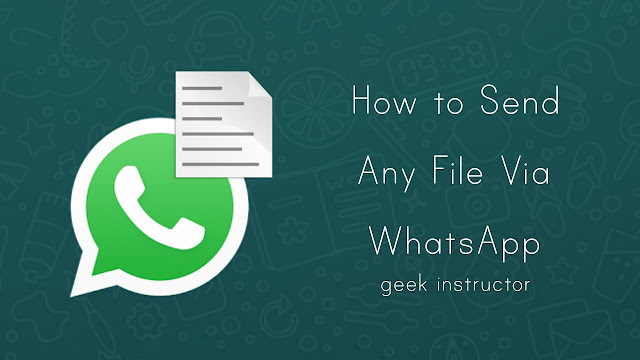 The file after downloading will be saved in the phone storage at "Internal memory > WhatsApp > WhatsApp Documents" and it can be accessed from any file manager app. 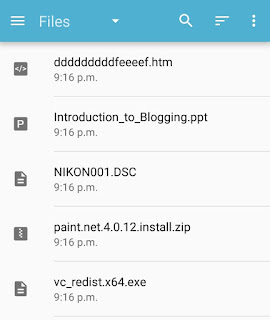 With this new feature, you can send any format file like APK, EXE, ZIP, TXT, DOCS and more. Note: In case if your file isn't received by the recipient, make sure that they have the latest version of WhatsApp installed. What if the file size is more than 100MB? As of now, you can send only 100 MB of file on WhatsApp. If your file size is more than this maximum limit, either compress the file or use cloud storage services like Google Drive and Dropbox. Google Drive provides 15GB of free space where you can upload any file and save your backup. Similar, Dropbox basic account includes 2GB of free space. You can easily upload your files on these cloud storage services by using their mobile applications. So this is how you can easily send text documents and other files on WhatsApp. If you want to ask something about this tutorial, please do share it in the comments below.